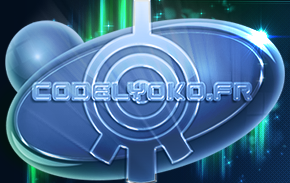 This file is here after an exchange of files between the 3 main Code Lyoko fansites at the time of season 4. Codelyoko.net gave this file, codelyokodreamers proposed the file with the links between Code Lyoko and Matrix, while codelyoko.fr proposed its file about Tron! The end of season 4 plunged all the sites into a state of a more or less deep lethargy, which is why this file arrived a little bit late on our website! This file is the intellectual property of "l'Anonyme" (Anonymous)! In episode 73, Replika, Jeremy understands that the Replikas of Lyoko created by XANA can only exist because they are managed by Supercomputers scattered all over the globe, and controlled by XANA. Conscious that these Supercomputers are probably not equipped with scanners, Jeremy decides to create a program able to send his friends into the real world from a Replika, near its Supercomputer, with the goal of destroying these computers and, sooner or later, defeating XANA. It's only in episode 78, Lab Rat, that he achieves this goal. The program, named "Teleportation" by its designer, seems inspired by the method used by XANA since season 1 to attack on Earth. The operation takes place in the following way. The Skidbladnir piloted by Aelita reaches a Replika and infiltrates it. Arriving at the reproduced Sector of Lyoko, it must be "linked" or "anchored" to a tower for Jeremy to have the access to it, the Skid being the go-between for the Supercomputer. Connected to this Replika tower, Jeremy activates it; and, once the tower activated, he sends one or many spectres to an area near the Supercomputer generating the Replika (within a radius of around 100 metres, obviously). These spectres, unlike the ones we usually saw in the series, don't contain information for a precise task, but the digital data (visibly converted into electric signals) of the Teleported Lyoko Warriors, who have the same appearance as on Lyoko. To sum it up, the Lyoko Warriors are sent to Earth in the form of polymorphic spectres. This implies two things. First, the only data sent into the spectre is that of the heroes on Lyoko, and not the ones from the scanners: episodes like Code Earth or Lab Rat teach us in a tacit way that during virtualisation, the data is in two "places". There is the data from the scanners, used during rematerialisation, which contains the composition and the exact structure of the body that passed through the scanner, and the data in the "video game" which is Lyoko, and which simultaneously contains the information about the heroes' Avatars, powers and weapons, and "mind", for lack of a better term. Because only this data is used for Teleportation, the heroes have their Lyoko look during the process. The main interest of Teleportation, as said before, is the reason why Jeremy made this program: to go to Earth from the Network to destroy Supercomputers; however, still on this goal, Teleportation presents multiple advantages: when a Lyoko Warrior is Teleported, he/she has the strength and the speed of a classic polymorphic spectre, but he/she also has the weapons the Supercomputer gave him/her on Lyoko: indeed, the data sent to the spectres also have weapons, like Odd's arrows or Ulrich's sabres. Moreover, the Teleported teens remain in contact with Jeremy during their mission on Earth who, by locating them, can also locate the area they are in, which most of the time is well guarded, and obtain a map, to guide the heroes through the maze that somewhat represents these secret bases and laboratories in which XANA squats. Occasionally during these missions, the Lyoko Warriors are attacked by xanafied people (or polymorphic spectres, we don't really know), robots, or XANA's monsters; in which case their weapons are at least useful. However, Teleportation is limited by many factors. We imagine that, if this wasn't the case, it would be too easy. Firstly, Teleportation has a time limit: in episode 78, we learn that the Lyoko Warriors only have around fifteen minutes to destroy the Supercomputer in the Amazonian base, a duration that Jeremy obviously lengthened, but probably not by an infinite amount. We can suppose it's due to the "fragility" of these spectres, itself due to their complexity, which it is imaginable that it makes them a little bit unstable (like the chemical elements which have too large a number of nucleons, making them radioactive), unlike the ones sent by XANA, usually. Still on this question of stability, like on Lyoko, when they are violently hit a certain amount of times, they are automatically de-Teleported. The same goes for the tower activated by Jeremy, which is deactivated (or rather activated for XANA) by William, typing the Code XANA like Aelita types the Code Lyoko. It doesn't break the Skid's link to the tower, but the tower does not manage the Teleported teens anymore, they are de-Teleported. In both cases, the ex-Teleported teens are back to the Skid, occasionally knocked out, sometimes for a long time (probably for the same reasons as when they exit the scanners, but it manifests in a different way, because they pass from the real world to a virtual environment). Nevertheless, it would be more cumbersome if the Skid were destroyed: in that case, the Teleported Lyoko Warriors probably purely and simply disappear; as for the ones who are not in submarine and fight to protect it, devirtualisation will cost them their life, due to the lack of relay between the Replika and the Supercomputer. That's why only two Lyoko Warriors are Teleported at the same time, while the two others are busy preventing monsters from destroying the Skidbladnir, and William from entering the tower. 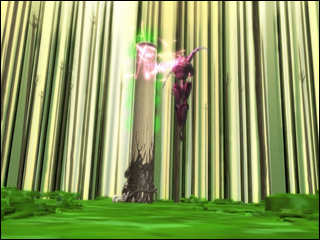 Aelita also tries to deactivate any tower activated by XANA to spread pitfalls in the way of the Teleported heroes near the Supercomputer. We can also wonder why, during an de-Teleportation, the Lyoko Warriors go back to the submarine and not the scanners: in actual fact, that's like other spectres. The data is sent by XANA to the towers, and goes out in the real world in the form of waves, or electric signals. The difference between this and Teleportation is that the data is in the Skidbladnir, linked to the tower. Why do the avatars disappear? Well, because they were not needed at the time. And if the data stopped being transmitted permanently, the Avatar reappears, the Skidbladnir's stored data of the Lyoko Warriors coming back into it. The first thing to note in appendix to this article about Teleportation is that, in episode 78, Lab Rat, we notice that, because of the fact that the heroes are on Earth, even with their Lyoko Warrior outfits, they a sense of touch: in Lab Rat, we see Odd complain about the pain caused by the return of his arrows, and, in the following episode, his hair ruffled and his outfit ripped when the generator explosion happens. 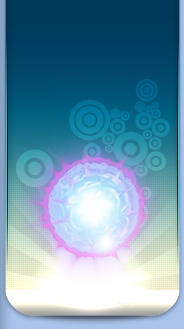 We can imagine that Teleportation is, especially for Odd, who has eight fingers, a tail and extra ears, something painful, and that only their nature of boosted spectres gives that resilience to them; however, we can understand that during a de-Teleportation, they might be in a state of substantial tiredness, which immobilises them on Lyoko (should we conclude that this is what could happen if someone was virtualised twice in a row? Or would it be even worse, but along the same lines? In both cases, it's dangerous, we know that for sure). Since episode 83, Hard Luck, XANA also uses Teleportation, to send Kankrelats to fight the heroes. We can wonder about the reason why it didn't do that before, even just to set them on the non-Teleported heroes, on Earth. Two hypotheses: either it didn't see the use of it, knowing that the Supercomputer is equipped with scanners, or Jeremy gave it the idea and, maybe, the means. It's not because XANA is a program that it knows how to do everything. It learns, and maybe not only had it never thought anyone could do that, but furthermore, it didn't know how to do it before Jeremy gave it the means. Jeremy would play a dangerous game, and the "rather symbolic irony", of which I will talk about later, could give XANA the necessary ideas to put the heroes in a bad spot! 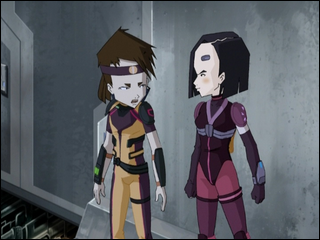 As seen higher up, the Teleported Lyoko Warriors have the same look as on Lyoko... More or less: firstly, we can notice some graphical differences (colour of Ulrich's headband, Yumi's make-up, Aelita's ears, absence of Kiwi's logo on Odd's chest); it is reasonable to attribute this to the animators' fantasy, but we can interpret it in a storyline way: a spontaneous evolution of the avatars during Teleportation, an "emergent property", which translates into a less significant phenomenon. 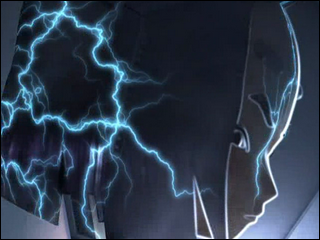 Secondly, the animators keep reminding us that the spectres are made out of electricity: when a Lyoko Warrior is hit, he/she "bugs up": he/she becomes blurred and seems to dissipate, and vibrates as if the screen were freezing; and, above all, as if the spectre was trying as best as they can to keep their cohesion, a task that, as we saw above, it doesn't achieve in the long term. Moreover, the heroes' weapons and powers are re-transcribed "as possible": Odd's laser arrows have, like Aelita's energy fields, a very electric aspect, unlike the look they have on Lyoko. As for sabres and fans, given that they are "permanent" objects, they have the same look as on Lyoko. These graphic modifications render the idea, which was not always evident in the other seasons, that the spectres really are electric; and that, consequently, the term of "spectre" is a misuse of language, for lack of a better word (except in the electromagnetic meaning of the term, which case the term is more exact). These considerations lead us right to the last point of this first appendix: powers: we saw the heroes' weapons on Earth, but they never used their powers, except Aelita (we'll come back to this later). How do we explain this? Well simply by the fact that the reproduction of these powers on Earth is impossible. Telekinesis more than the others, by the way. If Triplicate or Creativity seem so fanciful, telekinesis is just about impossible, unless we compare the effect of this power to a magnet; in any case, clearly less precise. Creativity, well, it wouldn't be unacceptable that Aelita creates extensions of her own spectre to form objects, but that strays too far from the basic power. As for Triplicate, that would be difficult, wouldn't it? In contrast, Aelita has a "digital" power. Explicable. But there are many hypotheses here too. The most plausible being the one which brings in the symbolism of Creativity. 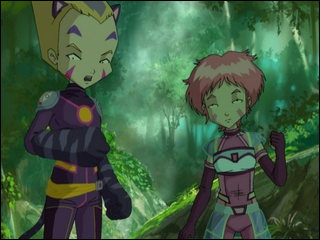 In season 1, Aelita develops this power as a program fighting against XANA. Also, she is in a position to interact with Lyoko, and to create landscapes on Lyoko (so to program them) from the inside. On Earth, this power, which has continued even after the loss of her "program" status, translates as the ability to interact with computers, earning the name "digital power". We can also think that it's a emergent property of the Teleported spectre (yeah, in Code Lyoko, we love that word), but we also might wonder how Aelita knew she could do it. The most plausible thing to think is that this "power" is linked to the true nature of Creativity, which is not the same as the nature of the other Lyoko Warriors' powers. We all remember these three images: a green tower to which the Skidbladnir is anchored, spectres sent to Earth to wreck everything, and William under XANA's control, deactivating the tower by typing, on the second floor, the Code XANA, to a remix of Aelita's theme in the tower. Curious reversal of the situation, isn't it? For three seasons, it was the opposite. XANA activated a tower, sent a spectre to Earth, and the Code Lyoko was typed in the activated tower by Aelita. In the Teleportation setting, it's Jeremy who attacks XANA, by activating a tower, and sending his friends in the form of spectres to attack it. There are two points to raise here. Firstly, the really particular nature of season 4, which is partially offensive: the heroes themselves are in a certain mindset owing to a less stagnant situation than in seasons 2 and 3, which were characterised by either the absence of a goal, or a goal too abstract to prevent a certain fatigue which, because of its concrete goal, didn't exist in season 1. In season 4, the goal is to bring William back, and to defeat XANA. For this, they had to travel, and to fight. The goal is concrete, and it's seen in the heroes' mindset. Secondly, how do we interpret this occasional reversal of the general situation? I think it is a writing way to show the viewers that if the heroes are going to defeat XANA, it's because of what they've learned from experience, which pushed them to evolve, too. Teleportation is a way for the heroes to say to XANA, "We are as strong as you now", even if it isn't really true. In any series, there is this kind of initiatory journey when the heroes are humans and, all the more so, young ones. This initiatory journey, in addition to symbolising the road to the adulthood, highlights notions that we understand, in the situation of season 4, that were compulsory for the heroes to acquire, to become more powerful, and, more precisely, enough to defeat XANA.